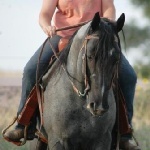 In the tradition of Joe Hancock - Fine blue roan and foundation bred Quarter Horses at Robin's Nest Farm! Confusion surrounds the exact foal date for Joe Hancock. By some accounts it was 1923, other say 1925. It doesn't really matter. Those who saw him run claimed that he could run so fast he'd bring tears to the rider's eyes. Named after his owner on the day of his first race, Joe Hancock began his racing career in Comanche, Oklahoma. Decendants of his owner claim he was never beaten in the quarter mile, and only once in a half mile race. He soon reached the point where he ran out of competition. 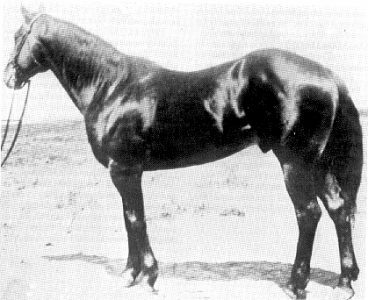 A bad infection from a wire cut led to his demise in 1943, but many ropers of today consider Joe Hancock to be the greatest sire of rope horses ever. In 1992 Joe Hancock was inducted into the AQHA Hall of Fame. The proud legacy of Joe Hancock continues today in the offspring of Azul Caballo Amigo, many of which are now standing at stud at Robin's Nest Farms! See for yourself. Compare the photo above with Azul Caballo Amigo!